Josh is an audio journalist. His work can also be heard on NPR’s StoryCorps and the podcast Out of the Box Conversations. Prior to his journalism career, Josh was an actor and playwright performing all around the country. He is currently a student at the Craig Newmark Graduate School of Journalism at CUNY. Comice Johnson is a writer, photographer and radio reporter. She enjoys covering New York City’s Mexican community, especially stories on art and culture. She has worked in Mexico City as an intern with VICE and currently works as an intern for NPR’s Latino USA. Matt Cutler started in radio as an intern at WSVU in Palm Beach Gardens, FL, helping cut commercials and sitting in on the morning zoo. He’s looking for a job in January so “be in touch,” he says. He’s on twitter @mattcuter. Rob Dozier is a writer and audio producer interested in culture, technology and the internet. He’s been in a complicated relationship with Drake since Degrassi and he drinks his coffee with extra soy milk. If you have comments or concerns, feel free to reach him on Twitter @robardzr. Max Zahn most recently worked as a reporter for Blank Slate Media, a set of six local newspapers in Long Island. Before that, he worked as an assistant editor at Tricycle: The Buddhist Review. His articles have been published in Columbia Journalism Review, Money Magazine, In These Times, and elsewhere. Born and raised in Brooklyn, New York, Ariama has many passions in life, including writing, poetry, photography and oil painting. She studies at the Craig Newmark Graduate School of Journalism at CUNY and contributes to her family’s design company, Alodie Cloud. She is the first self-published author and recognized slam poet among her friends and family. She hopes to gain even more experience in the future and continue to hone her craft as an artist. Camille Smith is in her third semester of the graduate program. She is from Chicago, IL and went to the University of Tennessee for undergrad, where she majored in journalism. Camille hopes to be a public radio reporter or go into producing podcasts after graduation. Michael Rosenthal is a student at the Craig Newmark Graduate School of Journalism at CUNY. 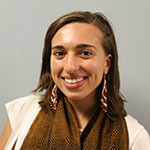 Allie Weintraub is a multimedia journalist. She’s reported on politics, education, health and legal issues. She loves to submit FOIA requests in her spare time and drinks iced coffee until it’s below freezing outside. She’s written for Courthouse News Service, Bklyner, NBC New York and most recently was an intern at StoryCorps.